There was a new women long jump national record at the SA T&F Series 4 held on 9th May 2015. Eugenia Tan jumped 5.94m. The wind condition was -1.9m/s. The previous record was at 5.88m held by Yu Long Nyu established in 1993. The record broken was 22-year-old and is pending ratification by SA. 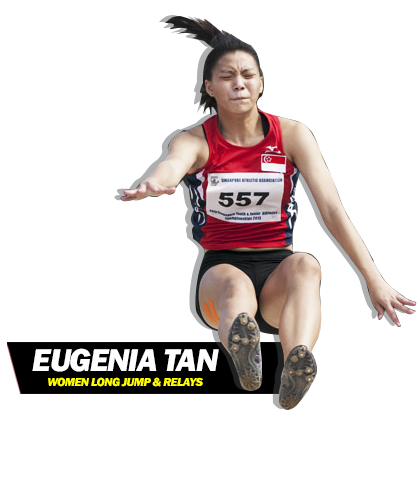 The sprint-jumps teen sensation Eugenia is 19-years-old (170cm, 62kg); her previous PB was 5.71m at the Series 3. She is coached by Katrina Hall and her previous coach was Margaret Oh. Eugenia is also joint record holder for the 4x100m women national record at 46.64s. She is currently part of the SEA Games squad. The 5.94m record is also a national junior and U23 record.